We bought this to bring to a family thanksgiving celebration. It’s rare for me to eat super sweet cakes like this, and even rarer to buy them, but once in a while its nice. The chocolate cake is very moist, with mild sweetness (slightly less than I expected), and the cream cheese frosting is pretty much what you would expect – very sweet. I didn’t detect much of a chocolate or coffee flavor. Overall this cake was pretty typical and neither disappointed nor exceeded my expectations. It was tasty enough for me to have a second piece, but I doubt I would go out of my way to buy it again. I think they should consider adding nuts to give a more unique texture and flavor. 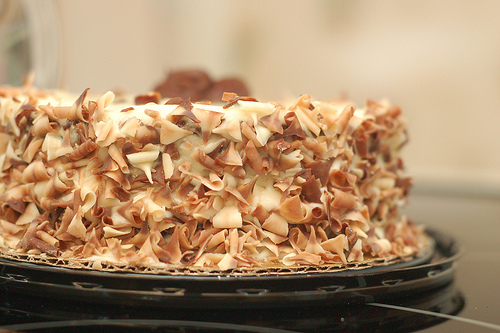 The great thing about this cake is that the frosting isn’t too thick or filled with strange ingredients so you can eat a good portion of it safely. Typically when I eat alot of icing on similar cakes I start to feel a little strange, but I had no such effect here. There are 8 servings per container, each containing 79 grams (2.8 ounces). A single serving packs 300 calories, a little over a third (120) from fat. There is also 220 mg of salt (9% of recommended daily amount), 1 gram of fiber and 3 of protein. As you would expect this super-sweet cake contains a massive 33 grams of sugars. This is par for the course in cakes of this sort, but its good to know if you are watching your sugar intake. Not only is this number a concern, but the fact that Sugar is the #1 ingredient listed on the label, so you know its used in a higher proportion than anything else. The ingredikents are pretty typical for a chocolate cake. There is no artificial or natural flavorings, colors, or preservatives, which makes this cake upper class in my booknjj. Sugar, Cream Cheese (Cultured Milk And Cream Salt, Xanthan Gum, Guar Gum And Or Carob Bean Gum), Flour (Unbleached Wheat Flour, Malted Barley Flour, Niacin, Iron, Thiamin Mononitrate, Riboflavin, Folic Acid), Water, Sour Cream,Chocolate Decorations (Sugar, Cocoa Mass, Cocoa Butter, Whey Powder,Lactose, Lecithin, Vanilla), Eggs, Butter, Chocolate (Unsweetened), Expeller Pressed Canola Oil, Vanilla Extract, Sodium Bicarbonate, Coffee Extract, Salt, Soy Lecithin (Emulsifier), Xanthan Gum, Guar Gum. We got this for $13.99 at Whole Foods Market. 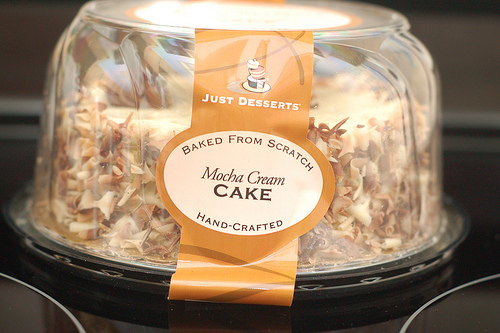 This cake is good for those who are trying to avoid artificial flavors, colorings, or other mysterious ingredients. However a run-of-the-mill flavor along with slightly expensive price makes it hard to recommend this for everyone. This ice cream has a very different flavor that is hard to put into words, especially if I force myself to not cheat and use the ingredients list as a reference. The best I can do is call it a nutty sweetness, punctuated with many small almond pieces – just enough to strike the perfect texture balance. There is a fudge sauce which winds to and fro within this creamy confection, but doesn’t seem to have much of a unique taste to it. Its nothing like any milk- or coconut-based frozen dessert. I haven’t had almond milk yet, but will have to try it sometime so I can determine if that is what lends the strongest taste component to this frozen dessert. Though a foreign flavor at first, if you take a few partially-melted spoonfuls you will soon find yourself yearning for more. I don’t really detect much coffee or chocolate taste, but the well thought out mixture of ingredients results in a complex flavor that is more than the sum of its parts. In a 85 gram, 1/2 cup serving (four total in the package), there is only 160 calories and 10 grams of sugars. The calorie count is much lower than Talenti’s ice creams (rough average 200) and many of Ben & Jerry’s (rough average 250), though it’s right in league with So Delicious coconut milk based frozen desserts. The amount of sugars is also very low, nearly one-half to one-third that found in many other frozen desserts or ice creams. At first I was clueless on how they can achieve such a great perception of sweetness with only 10 grams of sugars. Then when I read through the ingredient list I discovered erythritol – a nearly zero calorie sweetener which is also utilized in other sugar-free ice creams to add sweetness. Erythritol is 50-60% as sweet as table sugar, does not cause cavities, and only effects blood sugar (if at all). Sugar alcohols have gotten bad press because they can intestinal problems, such as nauesa, in large quantities. However, erythritol is claimed to have a less chance of these side effects compared to other sugar alcohols, and they are frequently reported only in doses over 50 grams. I emailed So Delicious and though they would not disclose the exact amount of sugar alcohol employed, I was told that there is less than 2%. This works out to be at most around 2 grams. To reach 50 grams dosage it would take 25 servings, or over 6 packages of this frozen dessert. Clearly there is little health concern, and I feel in this case erythritol advantages outweigh its weaknesses, especially if your diet does not contain any other products with this sweetener. Having said that, I think those who haven’t had sugar alcohols before should take it slowly – don’t eat a whole carton in one sitting. Tapioca syrup is listed as the sweetener present in the highest amount. It is made from the cassava root and is said to be a healthy alternative sweetener which is GMO and pesticide free. Fiber is 5 grams per serving. Protein is 2 grams per serving, a good bit lower than many other milk-based products which have easily have 5-6 grams. But honestly, nobody is going to be choosing which dessert they eat purely based on protein content. And while we are on this topic, even the difference between 160 and 250 calories is pretty minor. Even though its 40% more, for those eating only one or two servings it’s a very small fraction of most people’s daily calories. Having said that, if choosing between two ice creams that both taste great, I’ll usually choose the one that is lower in calories and sugar. Besides my usual pet-peeve “natural flavors” (present in both the fudge sause and the base), there isn’t too much that bothers me in the ingredient list. Water, used a base in both the almond milk and the fudge sauce, helps to keep the calorie and sugar amount down. Full ingredient list: ALMOND MILK (WATER, ALMONDS), ORGANIC TAPIOCA SYRUP, FUDGE SAUCE [DRIED CANE SYRUP, WATER, ORGANIC COCOA (PROCESSED WITH ALKALI), TAPIOCA STARCH, NATURAL FLAVORS, ORGANIC CHOCOLATE LIQUOR], ALMONDS (ALMONDS, COTTONSEED OIL, SALT), CHICORY ROOT EXTRACT, DRIED CANE SYRUP, ERYTHRITOL, PEA PROTEIN, NATURAL FLAVOR, COFFEE, CAROB BEAN GUM, GUAR GUM, KOSHER SEA SALT, MONK FRUIT. I just purchased mine for $5.99 at Whole Foods Market, where I recently noticed it in the frozen section. 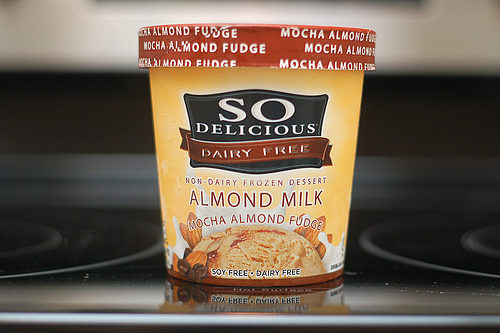 This almond-based frozen dessert has a unique, delicious flavor that’s addictive. I highly recommend trying some to bring variation and nutritionally round out your ice cream “diet”, especially to those who eat mostly milk-based products.